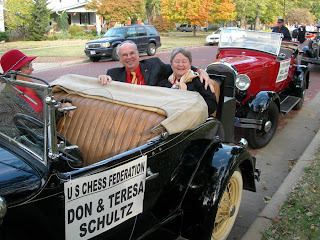 Don and Teresa Schultz. Don is the Vice-President of the USCF. This is a great essay by the longtime chess leader. Originally published on the USCF Forum, he graciously allowed me to reprint it here. Thank you, Don! The USCF ain't all that bad! Those campaigning on the theme that our USCF leaders are little guys who are not up to managing a large national entity such as the USCF, are running for the Board based on a flawed premise. The truth is USCF not only has qualified leaders but overall is a major contributor to the development of world chess. Take a look at chess in our country versus the rest of the world and you will see what I mean. For example, I just played in our Amateur Team East – What a great event! I doubt there is a tournament like it any where in the world. My hat goes off to Steve Doyle and the other organizers who year after year organize that marvelous tournament. Have you ever been to one of our national scholastic tournaments? So many teams competing, dedicated coaches. I know of no comparable tournaments anywhere in the world. Our scholastic leaders who organize these events are doing a terrific job. Go to any Olympiad and you will marvel at the comraderie among our teammates. I remember a statement by GM Gata Kamsky immediately after the US team in Calvia won the Bronze Olympiad medal: “I’m proud to be a member of the US team!” Kamsky said. We have fair elections. They aren’t so fair in many other federations where bribes and cheating are the rule and not the exception. Our TDs are definitely among the best in the world. The world rating system, where did it come from? The USCF of course. We have a Profession Player health and benefit fund where we contribute to the medical expenses of needy professional players up to a $10,000 per individual. I know of no other national federation providing such a service. Go down to Miami sometime and visit the Sid Samole Museum and the US and World Hall of Fame. It is, unmatched anywhere in the world. USCF has volunteers all across the country running tournaments recruiting and generally doing all they can to help. They are our thousand points of light and the reasons why we can always say: "The best is yet to come! I have visited federation headquarters on all continents and attended more FIDE Congresses than most, perhaps any American. I have traveled the world, lived in Europe ten years and played in their chess leagues and chess clubs. Without a doubt, I wouldn't trade chess federations with any of them. The author is the Vice-President of the United States Chess Federation and is running for re-election this year. Known on the internet as "CHESSDON", his website is at www.chessdon.com. Also check out his cool song. Photo, essay, and song used by permission.